3rd Revised Edition Published on August 28th, 2012, 452 pages. 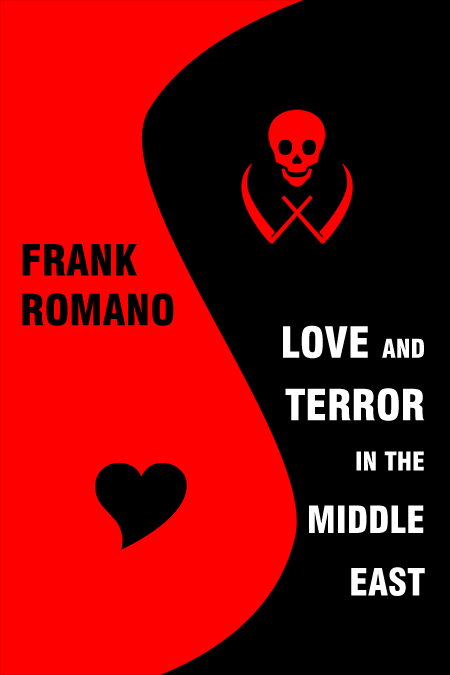 “LOVE AND TERROR in the MIDDLE EAST” dramatically captures the author’s efforts to promote understanding and cooperation in the region between Jews, Muslims and Christians. It details Romano’s arduous journeys between Israel and the West Bank, discussing issues and organizing activities among religious and national groups. Traveling between these areas has been risky: he has been harassed and arrested by the Palestinian police, harassed by Israeli soldiers and attacked by West Bank settlers. Last month, a peace activist friend of Romano’s, an Israeli Jew, was murdered in the West Bank. Several months before that, another of his interfaith peace activist friends was murdered in Jerusalem. This 3rd EDITION includes a new chapter entitled “Return to Killing Fields.” It recounts the aftermath of the murder of Juliano Mer-Khamis, peace activist, in the Jenin Refugee Camp and the author’s recent return there to uncover the truth buried deep within the shrouds of his friend’s mysterious death. The book is about the author’s recent quest for spiritual peace among religions in the Middle East, notably highlighting interfaith activities in Israel and Palestine. He takes readers to the middle of the Jenin Refugee Camp as well as Hebron and Ramallah, where he spoke with many former prisoners of the Israeli government. The author believes that from the Jenin Refugee Camp, the heartthrob of the conflict between Palestinians and Israelis, will flow the river of peace that will reach the four corners of the world. It also delves into his agonized divorce with his wife and separation from his three children after she fled to the United States, which ironically becomes a springboard for the author to seek his passion, interfaith peace in the Holy Land through love and understanding. In the meantime he meets another woman with whom he has a daughter. But his activities in Israel and the West Bank give rise to conflict with his new family. His passion for interfaith peace inspired the closing of his law firm in Marseille and the permanent separation from his partner and their daughter in Paris over his dedication to traveling to the Middle East and organizing marches and dialogues for peace in the middle of the conflict. Then the author takes us to the middle of the Occupied Territories, to the West Bank City of Jenin, for a peace march in the place that offered the greatest resistance to Israeli soldiers during confrontations over the past 20 years. His search thereafter for interfaith peace interweaves with his sometimes tragic personal life, the murder of two of his activist friends, hints of love and the desperation after a series of lovers and broken relationships. His life sometimes resembles more a personal battlefield than a peacemaking mission as he continues to look for love among Muslims, Jews and Christians in the Holy Land.